Know Your Business Partners to Avoid Pain! Don’t wait for negative headlines and huge fines — know proactively whether it’s safe to conduct business with customers, vendors and even employees. Last year a large bank was the subject of negative headlines for processing transactions with sanctioned entities. The cost became even more tangible than the negative headlines when the bank had to forfeit $619 million to the US Justice Department and the NY County DA’s office. Having the ability to proactively identify and prevent transactions with sanctioned entities is a key component of every leading company’s GRC practices. Assuring stringent processes are in place, are kept updated and are auditable helps to assure compliance and avoid the risk of not only negative press but sizable fines. 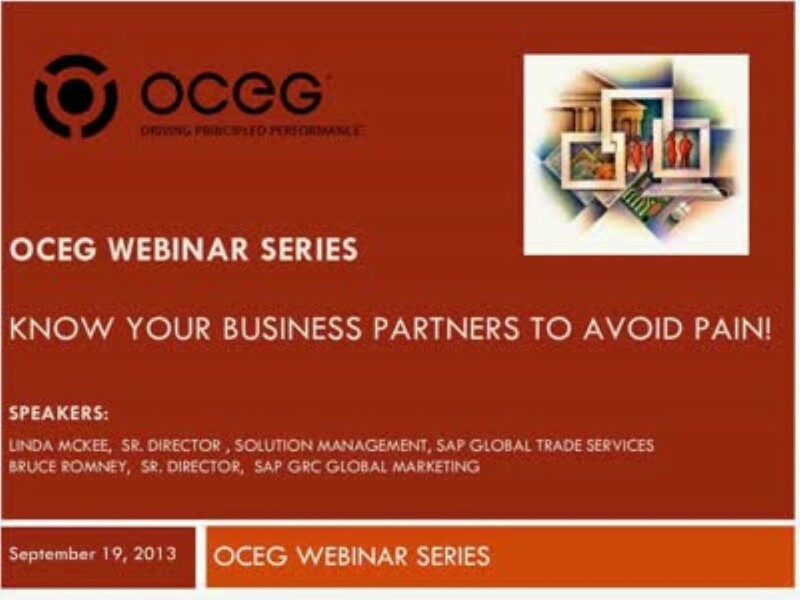 In this webcast, Linda McKee, Senior Director of Solution Management for SAP’s Global Trade Services solution will discuss what’s required and the steps your company can take to assure they know who they should, and more importantly, should not, conduct business with.